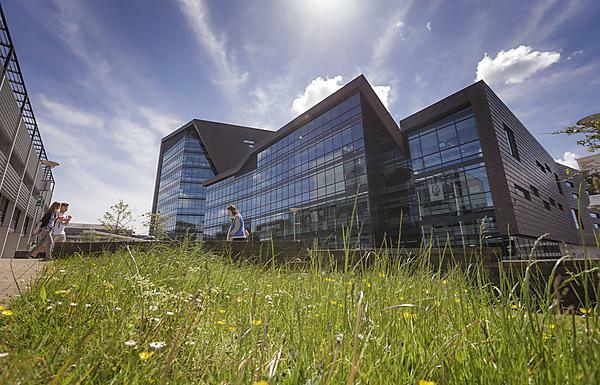 Our main campus is home to the Faculties of Arts and Humanities, Health and Human Sciences, Plymouth Business School, Science and Environment, and the Faculty of Medicine and Dentistry, as well as the University of Plymouth Students’ Union. Four miles north of the main campus and close to Derriford Hospital, you’ll find the purpose-built, multi-million pound Peninsula Allied Health Centre based on the University of St Mark & St John (Marjon) campus. It’s used by the Faculty of Health and Human Sciences and is where you’ll study if you’re on the Dietetic, Occupational Therapy, Operating Department Practice, Physiotherapy or Podiatry courses. Facilities for the Faculty of Medicine and Dentistry are adjacent to Derriford Hospital at the Plymouth Science Park. Please note that there is limited visitor parking available on the Plymouth Science Park site. Please ensure you discuss parking arrangements prior to your visit. The site is permit parking only and penalty charges will be incurred if no parking arrangements have been made in advance. Access guides for the campus and buildings are available from AccessAble. You’ll find our teaching and support facilities in a variety of locations right across the region. The University is the largest provider of professional health education and training in the South West. Our main study sites are in Plymouth and Truro, with certain courses taught elsewhere on the peninsula with facilities available for our students. NHS practice placements can be anywhere in the South West region. We run our health courses in Truro from the Knowledge Spa at the Royal Cornwall Hospital, where you’ll share first-class facilities with students from the Faculty of Medicine and Dentistry. The £14m facility was developed in partnership with the Peninsula College of Medicine and Dentistry and the NHS, and opened in 2004 by HRH The Prince of Wales. A multi-million pound extension is home to the Peninsula Dental School. The Dental Education Facility in Cornwall represents a capital investment of over £11.6m (funded through the Department of Health, the Strategic Health Authority, the Higher Education Funding Council for England, the ERDF Convergence Programme, the Peninsula College of Medicine and Dentistry and the National Dental Workforce Unit) – of which more than £4.7m of ERDF Convergence investment was approved for the extension and forward-looking research facilities. Cornwall College Camborne is the Cornish base for BA (Hons) Social Work. The College has enjoyed a remarkable £18m investment in new facilities in recent years. Our Social Work staff are based in the Penhaligon building, close to the £5m Learning Centre with its fully stocked academic library and 300 networked PCs. We’re proud of these key developments that build on our standing as a first choice university – from new campus accommodation and a unique waterfront diving centre to a £7m performing arts building and unrivalled wave tank testing facilities. We have worked hard to develop a residence life experience in our halls which we believe is of the highest quality and also unique in terms of support, engagement and year-round, fun activities we provide for you. From small beginnings as a School of Navigation in 1862, we’ve grown into a leading university with big ideas and a reputation for excellence. Come and see what you think on an open day.